As time goes on, not only we age, but so do our pets age. It always seems like just yesterday when we were watching a cute little puppy tearing up the furniture or running around the yard. But now, you may have a dog that seems to be behaving elderly. He’s been there to help keep your health good, but sometimes it needs you to keep its health good. Pets slow down and deteriorate with age just like humans do. They suffer from aches and pains as well as other various conditions, such as arthritis. Although you can’t stop the process of aging, you can slow down its debilitating effects by feeding your dog a proper diet. Unfortunately, many dog foods are not nutritionally complete. They tend to miss proteins and fatty acids, an essential part of a dogs diet to keep them healthy and active. Remember, a common pet owner mistake is not giving your dog the proper medication it needs. If your dog begins showing signs of arthritis or other joint problems, then it probably is time for you to start adding joint supplements to your dog’s diet, but remember to consult your local veterinarian before trying this. If you decide to go down this route, one of the best supplements you can take is Dasuquin. Made by Nutramax laboratories, Dasuquin helps your dog to rebuild cartilage in the joints that have been affected by arthritis. Essentially, Dasuquin is the number one joint supplement brand recommended by veterinarians, according to the manufacturer, Nutramax Laboratories Veterinary Sciences, Inc. In a nutshell, this company asserts that its formula stimulates cartilage matrix production, protects cartilage, supports joint function, and is the most complete supplement for joint support on the market. The moment your dog begins taking Dasuquin, the active ingredients in this supplement will kick in and begin repairing your dog’s joint cartilage. While your dog’s joints cartilage is busy repairing, their immune system will be flooded with nutrients and vitamins, which will further aid your dog’s ability to move around easier. Is Dasuquin an Over the Counter (OTC) Drug? Dasuquin isn’t prescribed! You can purchase it over the counter from pet stores, veterinarian offices or online retailers. Dasuquin comes in tablet form and is delivered in pre-measured doses. Dasuquin is pork liver flavored, so your dog should eat them up just like any other treat you would give them! If your pet still gives you a hard time, you can mix it in with their regular food. These extra ingredients provide your dog with additional therapeutic relief and continue to promote joint health. 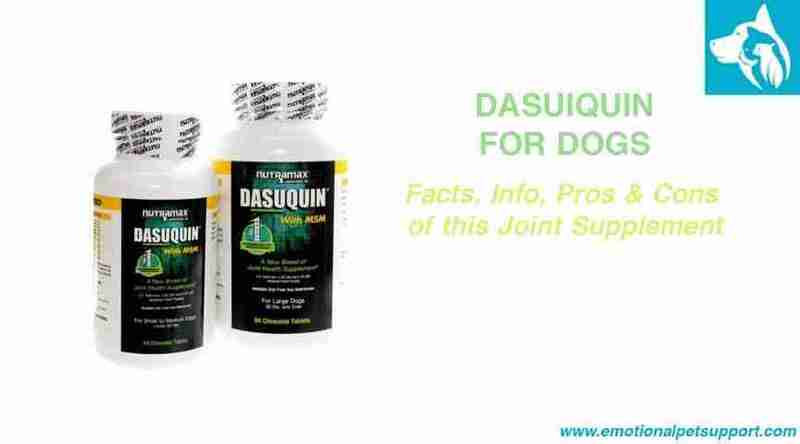 Dasuquin Advanced is designed for dogs who may be suffering from advanced cases of arthritis. Unlike Dasuquin, Dasuquin Advanced is subscription only and can only be made available by your veterinarian. Dasuquin with MSM provides joint relief by blending glucosamine hydrochloride, MSM, chondroitin sulfate, and ASU (avocado/soybean unsaponifiables) into a chewy snack. This particular mix is for larger dogs who weigh 60 plus pounds and is delivered in a soft, chewy form. Not only does Dasuquin improve the joint health of your dog, but it also has a beneficial effect on their immune system as well. Specifically, the MSM found in Nutramax Dasuquin provides a boost to your dog’s immune system by aiding the cells in absorbing essential nutrients and vitamins. Additional benefits include an intake of A, C, D, E, B 12, calcium, magnesium, antioxidants and amino acids. As a side note, Dasuquin is also offered for cats too! If you have a feline who suffers from joint pain, Dasuquin would be an excellent investment. Prices vary depending on the dosage, but Dasuquin is not cheap. Prices range anywhere from $41.99 to $119.99. You can get your dog some Dasuquin for roughly $60 from Santa Cruz Animal Health. Avocado/Soybean Unsaponifiables (ASU) can help to better manage your dog’s pain levels and provide a boost to mobility. Basically, Dasuquin is superior to Cosequin because of this one additional ingredient. The recommended dosage of Dasuquin varies depending on the size of your dog. For the initial four to six weeks you can give your dog higher dosages. After this initial stage where you’re introducing the supplement to your dog, you enter the “maintenance level” where you can cut back on the dosage. Keep in mind that your dog may suffer from a number of side effects. Side effects include loss of appetite, dizziness, and a minor upset stomach. In most cases, these side effects go away after a few days. Though it’s expensive, especially when you compare it to other joint supplements out there, Dasuquin is a premium joint supplement that utilizes the highest quality ingredients. Based off of the many Amazon reviews of satisfied customers and all of the benefits that it provides for your pets, Dasuquin is most certainly worth the price. If your dog suffers from arthritis, give Dasuquin a try.